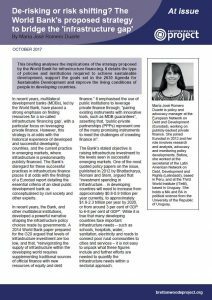 In recent years, multilateral development banks (MDBs), led by the World Bank, have placed a strong emphasis on finding resources for a so-called infrastructure ‘financing gap’, with a particular focus on leveraging private finance. However, this strategy is at odds with the historical experience of developed and successful developing countries, and the current practice in emerging markets, where infrastructure is predominantly publicly financed. The Bank’s disregard for these successful practices in infrastructure finance places it at odds with the findings of a Eurodad report detailing the essential criteria of an ideal public development bank as conceptualised by civil society and other experts. In recent years, the Bank, and other multilateral institutions, developed a powerful narrative shaping the infrastructure policy choices made by governments. A 2014 World Bank background paper prepared for the G20 argued that levels of infrastructure investment are too low, and that, “reinvigorating the supply of infrastructure within the developing world requires supplementing traditional sources of official finance with new resources of equity and debt finance.” It emphasised the use of public institutions to leverage private finance through, “pairing existing instruments with innovative tools, such as MDB guarantees”, asserting that, “public-private partnerships (PPPs) represent one of the many promising instruments to meet the challenges of crowding finance in”. The Bank’s stated objective is raising infrastructure investment to the levels seen in successful emerging markets. One of the most quoted policy papers on the issue, published in 2012 by Bhattacharya, Romani and Stern, argued that “investment spending in infrastructure… in developing countries will need to increase from approximately $0.8-0.9 trillion per year currently, to approximately $1.8-2.3 trillion per year by 2020, or from around 3 per cent of GDP to 6-8 per cent of GDP”. While it is true that many developing countries face important infrastructure needs – such as schools, hospitals, water, sanitation, electricity and roads to connect poor rural communities to cities and services – it is not easy to unpack what these figures include and further efforts are needed to quantify the infrastructure needs within a sectorial approach. It is important to note that figures reflecting a large financing gap are being used by financial institutions, and the governments backing them, to justify political choices. 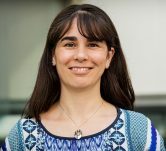 As Elisa Van Waeyenberge, a researcher from the University of London, argued in a 2015 paper, the Bank’s policy response has often been to promote an expanded role for private capital in financing development projects, rather than increasing and strengthening the public financing of development. This trend may be driven by the mass of wealth in the hands of institutional investors seeking stable and profitable investment opportunities, and is aggravated by rich nations’ unwillingness to tackle illicit financial flows and tax havens effectively. Despite the fact that the UN Conference on Trade and Development estimated in 2015 that developing countries may forego as much as $300 billion annually in development finance as a result of the use of the current global tax system by multinational corporations, and that in the UN 2015 Conference on Financing for Development, rich nations failed to respond to developing countries’ call for a UN global tax body. Arguments advocating for the private financing of infrastructure, however, fly in the face of historical evidence. The 2014 Bank paper for the G20 referenced above found that over the past decade in developing countries, “private capital has contributed between 15 and 20 per cent of total investments in infrastructure”. This means, of course, that public investment has been 80-85 per cent of the total, despite the limited fiscal space for public investment many states have due to the tutelage of the Bank and the Fund. Successful economies are already providing very high levels of infrastructure financing, largely through public funding. As described by the IMF in its 2014 World Economic Outlook, there are several key characteristics that distinguish infrastructure financing from other types of capital and make public financing the first, best option. First, infrastructure investments are often large, capital-intensive projects that tend to be “natural monopolies”. Second, they tend to have significant up-front costs, but the benefits accrue over very long periods of time, often many decades. Third, infrastructure investments have the potential to generate positive externalities, so that the social return to a project can exceed the private returns it can generate for the private operator. The issue is how to raise public financing for infrastructure, and to increase its efficiency, as measured comprehensively, and not presume the ‘gap’ must be bridged by private finance. A 2016 Eurodad research paper found that, in light of the IMF’s framing of macroeconomic issues, including through its surveillance work, developing countries are seldom given the policy space to consider public finance as a ‘prudent’ option. Despite bold headlines, the private sector has remained largely unwilling to invest in large-scale infrastructure as it does not like the risk-reward ratio. It is therefore important to unpack the implications of this strategy as it relies heavily on the idea of changing the risk-reward calculation by ‘de-risking’ private finance, leaving many questions. 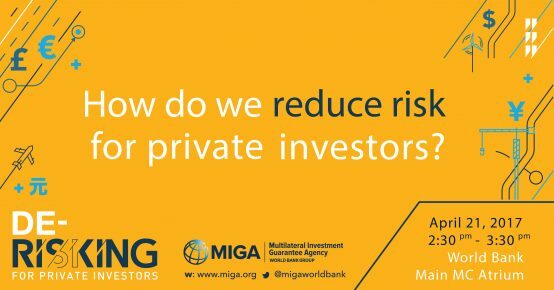 De-risking for private investors – what about citizens? 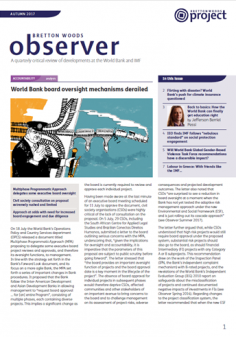 The objective of the Bank and other MDBs is to “systematically and at scale … maximise the impact of scarce public resources,” by using the cascade approach (see Observer Summer 2017), as presented in the April 2017 “Forward look” document. According to the cascade’s principles, the Bank, “first seeks to mobilise commercial finance” and “only where market solutions are not possible through sector reform and risk mitigation would official and public resources be applied.” In practical terms, this approach allows for a renewed way of framing the role of MDBs as institutions that create markets. This has a potentially significant impact on the internal incentive structure of these institutions, precisely at a time when civil society organisations (CSOs) have been calling for internal incentives that encourage development outcomes over lending volume (see Observer Summer 2015). The cascade approach implies a strong emphasis on ‘de-risking’ private finance by promoting changes in the investment climate, both globally and at national level, that give more favourable conditions to private investors, such as through changes in regulatory frameworks to protect investors’ interests and altering risk-reward calculations by providing subsidies, guarantees, and various other risk-mitigation instruments. In essence, the approach assumes that the private sector can be the natural supplier of capital, which is a wrong and dangerous assumption to make in the case of infrastructure, and even more in the case of education and health. According to the Bank the cascade “is currently focused on infrastructure but will be expanded to finance, education, health and agribusiness”. This approach leads to complicated ways of enticing private capital, rather than first evaluating whether the potential risks are worth it by considering, for example, if is there a revenue stream (i.e. if the project is profitable) and sufficient risk mitigation measures. CSOs maintain that governments should select the best financing mechanism, including examining public financing options, on the basis of a thorough and transparent cost-benefit analysis that takes into account the full fiscal implications over the long run and the overall impact on the public purse and on users, including equity and affordability considerations. In a 2015 report on PPPs, Eurodad pointed to worrying effects of encouraging private investment in infrastructure. For instance, the report stressed that to package infrastructure assets in a way that will be of interest to distant and risk-adverse institutional investors, such as pension funds, projects must become larger, and the risks will have to be ‘mitigated’, or in practical terms, transferred to the public sector. The report showed that the state’s absorption of substantial risks for packages of PPPs – which often rely on direct and indirect government support – can exacerbate financial instability, as it did in the case of Portugal, among others. For instance, according to the IMF, in 2014 Portugal’s liabilities associated with state-owned enterprises and PPPs represented 15 percent of GDP. Moreover, the World Bank strategy focuses on investors’ risks, according to Michael Cernea – a sociologist formally retired from the World Bank – while tendingto overlook the risks often borne by the most vulnerable populations. Experience has shown that large-scale infrastructure and agribusiness projects can often lead to mass displacement, marginalisation and impoverishment of affected populations, including women. To date the Bank’s Forward Look does not include enough provisions to ensure that its interventions will effectively support the realisation of citizens’ rights, including their rights to essential services. As has been often noted, the private sector has failed to invest in service provision in marginalised or excluded communities precisely because these investments are not profitable. Experience has also shown that attempts to make these investments profitable results in arrangements that can limit access to essential services or leave the government to pay for the difficult-to-reach populations without the possibility of cross-subsidies from profitable urban services. The 2030 Agenda: What kind of policies and institutions are needed? Sustainable Development Goal 9 (SDG9) commits states to “build resilient infrastructure, promote inclusive and sustainable industrialisation and foster innovation.” Importantly, the framing of this goal acknowledges the important contribution of infrastructure to the rise of productivity in industrialisation. According to Manuel Montes, from the intergovernmental think tank the South Centre, “in order to implement SDG 9, pro-active industrial policies that take into account aspects of inequality and sustainability” are essential. Montes argued that, “SDG 9 will require reviving state leadership over key economic actions, instead of reserving for private parties unfettered scope for action.” He stressed long-term finance is key to effective industrial policy that supports the diversification of the economy, providing a way out of the natural resource dependency that affects many developing countries. As Eurodad and partners argued in an April 2017 discussion paper Public development banks (PDBs): towards a better model, PDBs can – and should – play a significant role in development. Multilateral, regional, and crucially, national development banks can provide long-term, sustainable, predictable and counter-cyclical funding in support of nationally-driven development strategies. The contribution of the World Bank, among others, to delivering sustainable development outcomes is brought into question by their investment decisions, strategies and internal policies and incentives. The paper identified four areas where institutions such as the Bank need to up their game. Firstly, the Bank should have a clear mandate which focuses solely on delivering development-focused outcomes. This is critical if it is to support the SDGs, and means that outcomes should go beyond a focus on economic growth. Rather, they should adopt a human rights-based approach, where the quality of investments is judged by their contribution to reducing carbon emissions or social inequalities. Secondly, the Bank should be extremely careful about how and where it raises money, and how projects are selected. It is essential that PDBs invest in ways that ensure that their development mandate takes precedence over financial returns. For instance, the cascade approach appears to be at odds with a development-oriented approach. The current PPP selection criteria are questionable as they seem to contribute to the perpetuation of the extraction of natural and financial resources, more than to delivering development outcomes. Thirdly, the Bank should have clear systems and structures to ensure that sustainable development outcomes are properly measured and documented, and remain the overall focus of its operations. Fourthly, good governance is essential, including strong transparency and accountability policies, representative and democratic governance structures, and open, inclusive and accountable decision-making. In particular, the Bank must work hard to avoid over-riding democratic decision-making in the countries in which it invests. States should at least have an equal say in decisions affecting their own development. In sum, as illustrated by its cascade approach, its approach on PPPs and push for ‘de-risking’ of private sector investments, the World Bank diverges from the blueprint for a model PDB as put forth by Eurodad and its partners. The strategy developed to finance infrastructure, based on leveraging private finance, seems to privilege the status quo over the transformational change that the 2030 Agenda urgently requires.